Embarrassing things can happen to anyone at anytime. The embarrassing day occurred for one woman when she was visiting Guposhan National Forest Park in China. 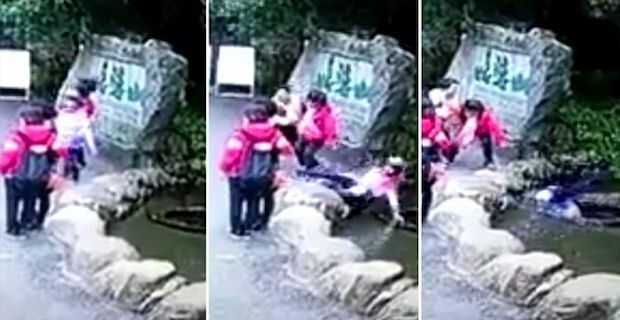 While posing for a photo with her friends, a 50 year-old tourist stepped backwards and tripped over a pond well. She then fell down a 3 foot drain which shocked both her and her friends. The other members in her tour group rushed over and she was eventually pulled out. She was sent to the hospital but thankfully did not sustain any physical injuries. She was treated for shock though. Eventually she rejoined her group and continued her visit around the Park in the Guangdong province. The entire event was recorded on CCTV. The director of the park stated that this had never happened before but now they will take precautions by adding more warning signs and a security mesh. Hopefully nothing like this will happen again in the near future.